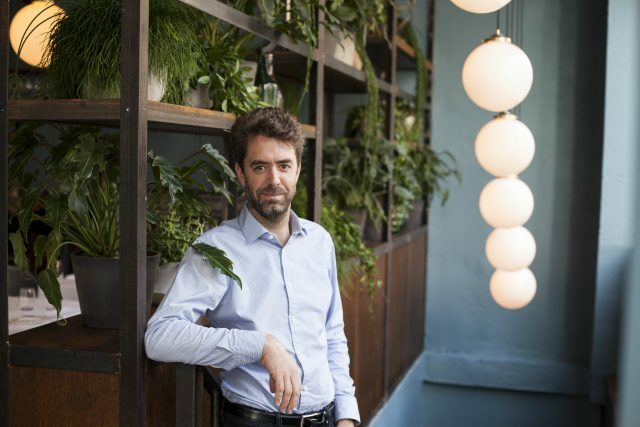 “I am foremost a wine lover and wine drinker, and consider myself lucky to be able to earn a living from my passion,” says Mathieu Germond, former restaurant manager of Pied à Terre, who launched his debut solo venture, the rustic, seasonally focused Noizé in Fitzrovia in October 2017. Taking over the site of the highly acclaimed Dabbous on Whitfield Street, Germond has softened the harsh industrial interiors, and aims to bring a convivial French atmosphere to central London. Born in Montlouis-sur-Loire, his childhood among the vineyards of the Loire Valley continues to influence Germond to this day. His grandparents ran a farm in the tiny village of Noizé, which inspired his restaurant’s name. His passion for food and wine was further ignited at 15, when he attended a catering school in Tours. Five years later he packed his bags for the French Basque country, where he fell in love with the wines from southwest France. Shortly after, the bright lights of Paris beckoned, where his uncle ran a small restaurant “with a fantastic wine list – he had one of the best palates I’ve ever encountered”, says Germond. After immersing himself in the world of French wines in Paris for four years, Mathieu made the move to London in 2002, and started his wine journey working under the wing of Matthew Wilkins at. The Capital Hotel. A year later Pied à Terre’s David Moore employed him as a sommelier at his Charlotte Street restaurant. Germond ended up enjoying the atmosphere so much that he stayed at the venue until the opening of Noizé in late 2017, having worked as restaurant manager since 2005. He describes his latest venture as “a mix of all my experiences”, and is keen to champion “great food with bold flavours served in a straightforward but elegant style, alongside good-value wines”. Featuring drops from Sicily to the Swartland, the wine list at Noizé is broad and creative. “After 20 years of working on the floor, it’s exciting to be able to serve wines at the right price,” he says. On his tempting prestige list, which features heavy hitters such as Dom Pérignon, Guigal, Gaja and Grange, wine mark-ups are capped at £50, offering greater value for diners the more they spend. Customers are also encouraged to bring their own wines for a £20 corkage fee. He dreams of making wine in the Rhône Valley, thanks to his unwavering love of Syrah, but topping his bucket list at the moment are Leroy Richebourg 1998 and Giacomo Conterno Barolo Monfortino 1994.